It’s been a rainy, blustery weekend here in Santa Barbara, and we really did need it. Over 5.5 inches of rain in a few days won’t clear up the drought, but it certainly helps. There’s even been water in the creeks over the past few days, and I haven’t seen that since we moved here over a year ago. But it does give me time to get back in the kitchen to cook and time to get a blog posted—without the beautiful weather we’ve come to expect this winter, it’s nice not to feel the pressure to be outside and active. Sorry, I realize that must sound terrible to people reading this who have had to put up with lots of storms, flooding and cold, but I guess we all have to deal with what we’ve been given! I’m going to get the garden started next weekend, since the rain will be long gone. But the drought here in California is going to push fruit and vegetable prices way up across the country—did you know that this state produces about 85% of the produce for the U.S.?—so I suggest everyone starts growing whatever food they can. 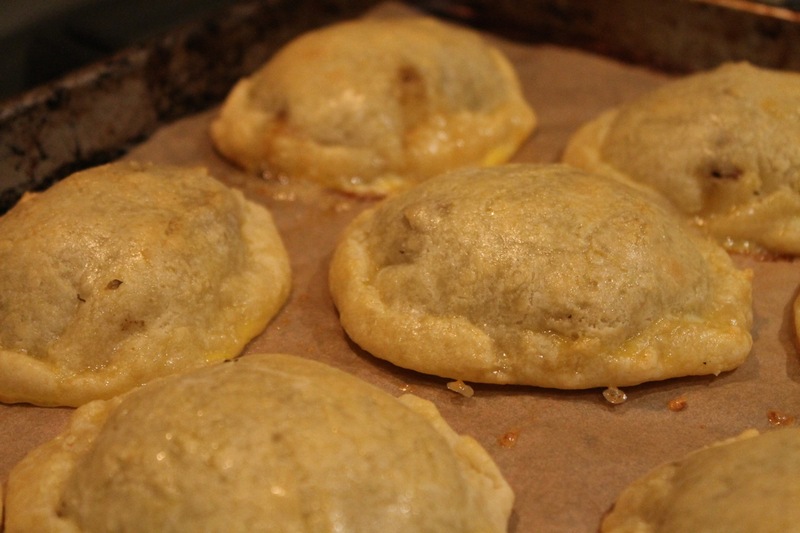 But in the meantime, I suggest you make some of these Jamaican patties, no matter where you live. They are tasty, spicy and very moreish. I couldn’t stop The Husband from eating them when they came out of the oven. I kept catching him in the kitchen taking little bites of one patty. These didn’t come out as spicy as the ones I remember from the place around the corner from my flat in Battersea, South London. Those had some serious kick. But if you’re sensitive to spice, please halve the amount of chili in these. They weren’t spicy to us, but we’ve got iron tastebuds. 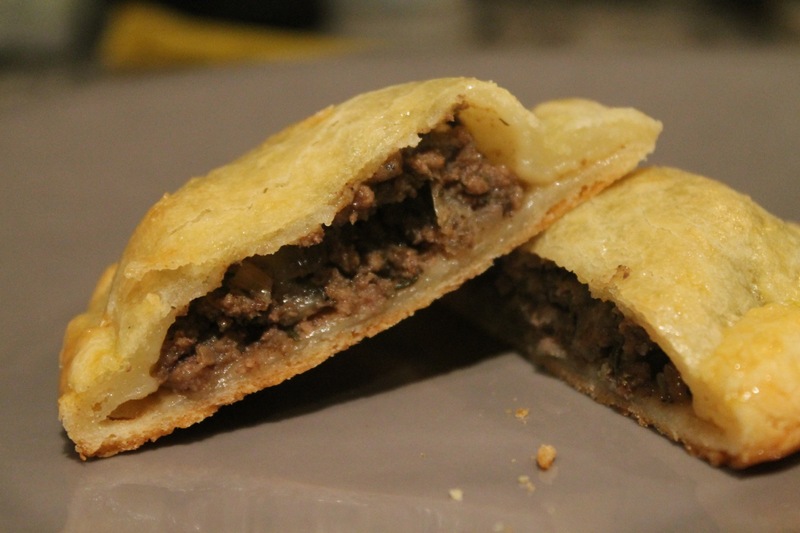 Vegetarian/vegans, I would recommend using a ground-beef substitute like Yves’ meatless products, and a nice real pastry recipe like this one here. This pastry recipe uses gelatin, so it’s not suitable for you. You probably could substitute pectin, but I’m not sure how much. And besides, if you’re fine with gluten, go ahead and use real flour! And whatever you do, keep an eye on the rest of your household when they come out of the oven. One or two might go missing before you even know it. Sauté the onions and green onions in beef fat, coconut oil or almond oil until starting to turn brown. Add the meat and the thyme, allspice, curry powder, chili, coconut aminos and garlic. Cook until the meat is brown, then season with salt and pepper. Add the water and the coconut flour, and cook for a further 15 minutes until the water has thickened into a gravy. Cool filling completely before using it in the pastry. Combine flours, salt and curry powder in a large bowl. In another bowl, add the water and sprinkle the gelatin over it. Whisk in the eggs and the oil, then stir the wet ingredients into the dry using a spatula. Then knead until all the flour is absorbed. Preheat the oven to 400°F. 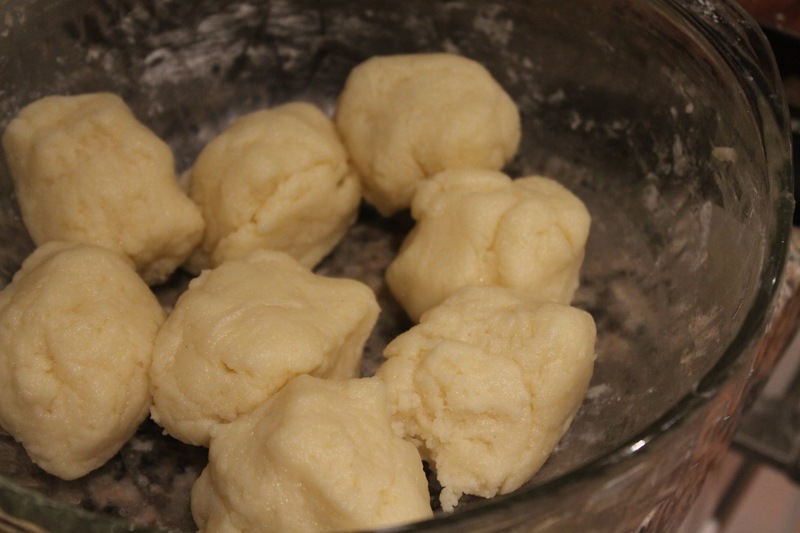 Divide the dough into 10 equally-sized pieces. When the filling is cool and you’re ready to make the patties, divide each portion in half and roll into balls. 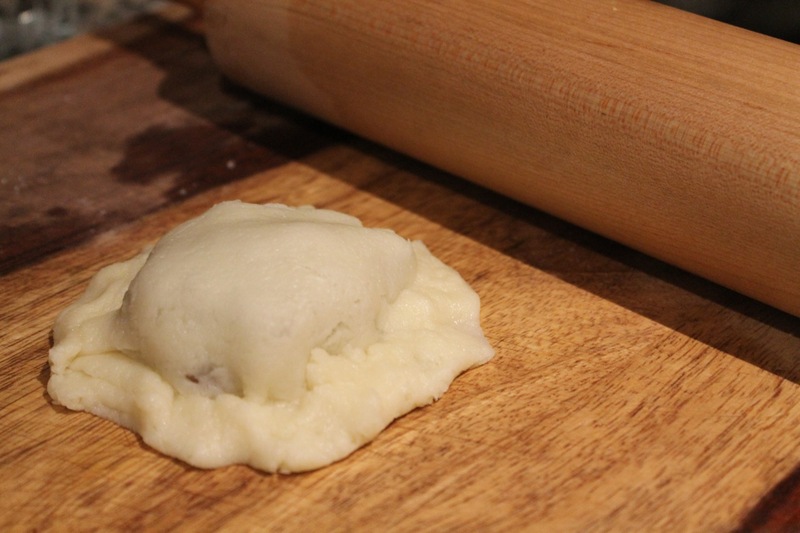 Use a rolling pin to flatten each ball, place 2-3 tablespoons of filling on one piece and cover with the other piece. Fold the edges of the bottom piece over the top piece’s edges and seal well. Repeat with the other nine portions of dough. I had about a cup of the filling left over, which was great scrambled into eggs later in the week. 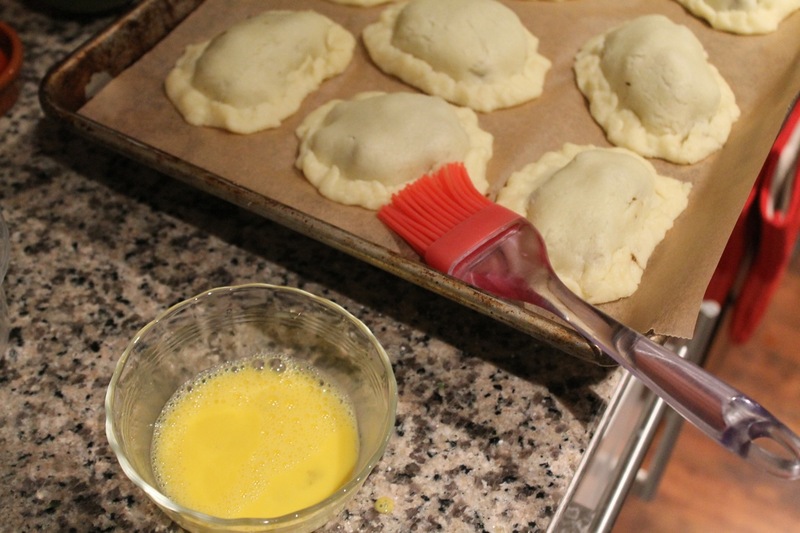 Whisk together the egg yolk and water, and brush the top of each patty well with the wash.
Bake in the oven for about 30 minutes, rotating the tray halfway through. Attempt to wait until they cool to eat. Add all ingredients to a blender and blend on medium until combined. You had me at Jamaican! I know, right? Their spice combinations are always amazing! Thanks, Jeff! They turned out very nicely, I must admit! Oh my goodness! Ja-Mai-can me hungry alright! 🙂 Love the idea of a bison mince, apparently they have amazing milk for cheese too. I tried a burger once & it was awesome. I too have iron clad taste buds! We could totally be chilli freaks together!!! I would love to be chili freak buddies with you! At this point we will have to be chili freak pen pals. 😉 Bison is getting much more popular out here, and it’s a delicious alternative to beef. 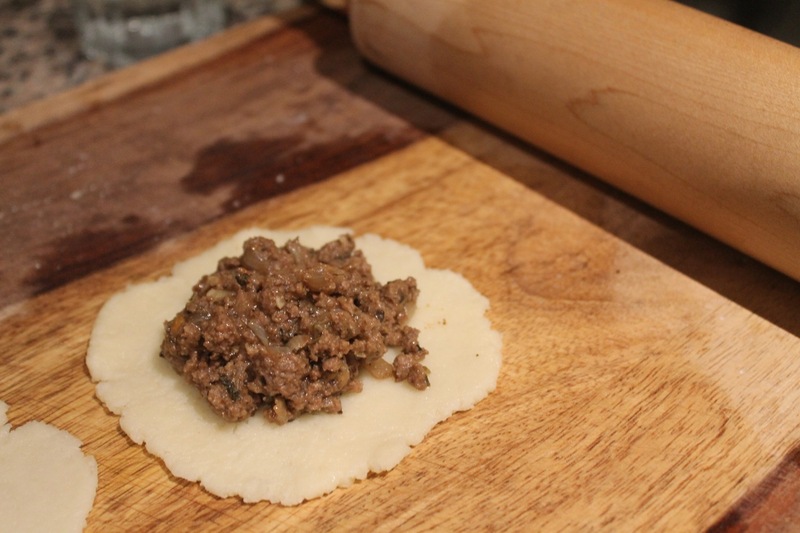 Especially mince, as it can be a little lean. Here’s to more spice in our lives! I hope you make them! They are very easy and so worth it. Thanks for the compliment!